Wildfire smoke hung in a hazy heavy cloud over parts of California this month, but it won’t stay for much longer. Rain is in the forecast, which could bring some relief from the poor air quality that’s blanketed parts of the state. But what happens to smoke after it is lofted into the air and starts interacting with air currents and weather is far more complicated than it might appear. The smoke that billows out from a wildfire is incredibly complex. In addition to solid particles like ash, there are gases and droplets of liquids, all loosely roiling up into the atmosphere. “Smoke is made up of lots of different things, and every single piece of smoke evolves differently.” Emily Fischer, an atmospheric scientist at Colorado State University says. She explains that what we think of as smoke is really comprised of thousands of chemical species. Those thousands of different kinds of compounds all have different interactions with the atmosphere, clouds, and each other, changing over time. Bela is a researcher at the University of Colorado and the National Oceanic and Atmospheric Administration (NOAA) who is leading the computer modeling effort for the FIREX-AQ project. 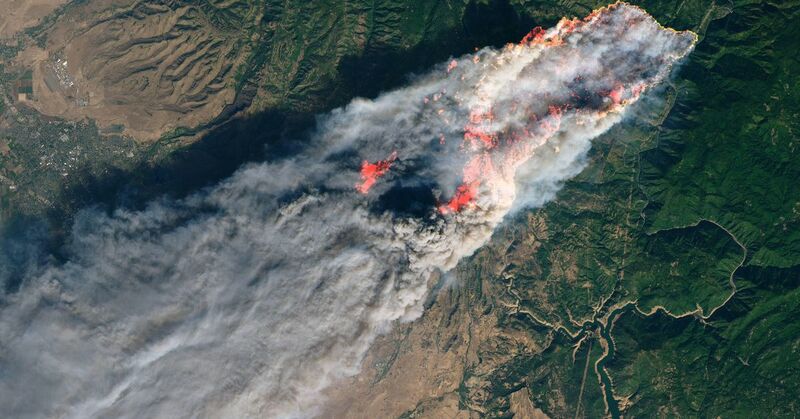 FIREX-AQ is supported by both NOAA and NASA, and will start gathering data by plane next year, flying directly into the plumes of wildfire smoke. Inside billows of wildfire smoke is not usually a place that people would choose to be. Breathing in smoke from wildfires can have severe negative health consequences for people, especially those with existing respiratory conditions, like asthma. And it could get worse. A study published in July found that deaths attributable to wildfire smoke could double by 2100. But even as wildfire smoke becomes more ubiquitous, there’s still a lot we don’t know about wildfire smoke. One of the things that the researchers hope to understand is how smoke evolves over time as it travels through the atmosphere. It isn’t an easy problem to solve — how long smoke stays aloft is also incredibly complex. Depending on how hot the fire is below, smoke can either hang low near the ground or be lofted high into the sky, traveling across entire continents. Weather patterns play a huge role in smoke’s longevity. In some cases, winds or rain can clear away smoke in hours or days. In California last week, a high-pressure system kept the air in the region relatively stagnant, and smoke from the fire stuck around, sending the air quality plummeting. But smoke can’t hang around forever. “Air is always turbulent, [the smoke] will dilute and disperse over time and eventually fall out,” Bela says. When rain, like the rain that California is getting now, enters the picture, things can happen much more quickly. “Rain as its falling will smash into particles and pick them up,” Bela says, even water vapor in clouds can get in on the act. Gases from the smoke can dissolve in the clouds, evolving into different chemical compounds and eventually falling out of the sky with the rain.